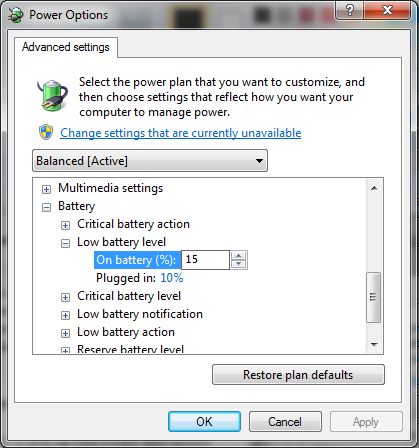 You can set custom action on low battery in your windows 7/8 laptop. Windows gives you ability to choose whatever action you want to do when your laptop system detects the low battery. This can be very helpful for those who want their computer to shutdown properly in low battery situation automatically, so that next time they open their laptop they don’t have to face “resuming windows” situation. Open the Control panel (View by: Category). Click on Hardware and Sound. Now under the Power Options section click on change when the computer sleeps.It’ll show you the current power setting. Click on Change advanced power settings option in the bottom of the window. This will open a window where you can edit your power plan as shown in figure below. Scroll down in this window box and expand the battery node. This will show you different battery related settings. You can change the low battery level on battery and on charging (Plugged in). In the above example i have set low battery level on battery to 15%. Expand the Low battery action node and change the setting according to your need. The available options are Do nothing, sleep, hibernate and Shutdown. You can select Shutdown option for On battery node. This will result in Shutdown of laptop when your system detect low battery ( as in above example when battery is 15% remaining).